You can define the particular elastic log curves for P slowness, S slowness and density from the LAS file for each well in Synthetics. Define your own equation or use a standard equation for the log curves if the well log is not defined in certain parts or the entire well log is missing. 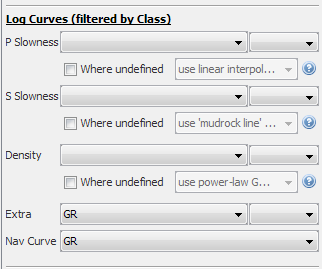 Go to the Log Curves (filtered by class) section. At P Slowness, S Slowness and Density, select the P slowness curve, S slowness curve and density curve, and their respective units of measurement. 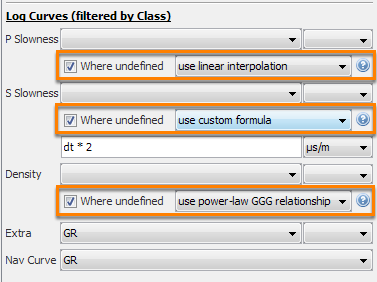 Click the Where undefined check box to input your own equation or use a standard interpolation equation to define parts of the well log that are undefined (see below). You can define one additional log curve to be displayed at Extra. If the S slowness and density curves contain undefined points, the log curve will be broken into multiple sections separated by those points. In this case, Insight will only display the synthetics of the longest defined section of the curve. Select the Where undefined check box and choose the formula to be used to help Insight define the points and fill in the gaps. Select use linear interpolation to do a simple linear interpolation to fill gaps in the P slowness curve. Select use 'mudrock line' formula to use the standard mudrock line formula where Vs = 0.862*Vp - 1172 (m/s). Otherwise, select use custom formula to define your own formula using the standard operators. Tip: Click on the Help icon (?) for more information on building S slowness curves. Select use power-law GGG relationship to use the standard Gardner/Gardner/Gregory (GGG) formula where rho_bulk = 1.75*(Vp/1000)^0.265 (g/cc). You can also select use polynomial GGG relationship to use the polynomial form of the GGG relationship where rho_bulk = -0.0261 * (Vp/1000)^2 + 0.373 * (Vp/1000) + 1.458. Otherwise, select use custom formula to define your own equation using the standard operators. Tip: Click on the Help icon (?) for more information. 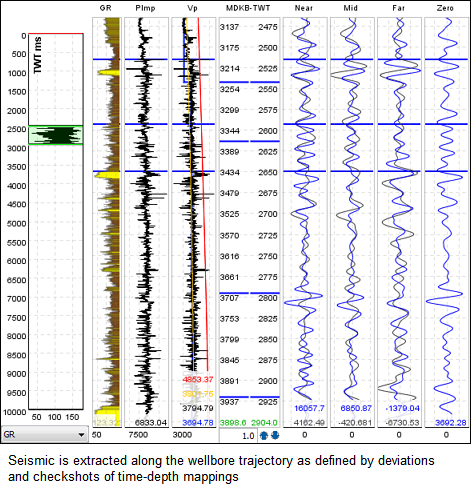 After you have configured the synthetics for the angle stacks and defined the log curves, the synthetics and seismic traces (blue and black lines) will be displayed in the Synthetics–Seismic Panel. Tip: You can do a quick quality check on the synthetics by going back to the Synthetic tab and change the wavelets used. In addition to this, open the Wavelet tab in the main Control Panel and adjust the parameters of the wavelets. You can also go to the Checkshot Panel in the Synthetics window and adjust the checkshots. As you do these, the display will be updated on-the-fly.